Writer, teacher, producer of documentary series, "Digging Detroit." Originally posted in Kevin Walsh's blog, MyMediaDiary.com. "On summer nights, before anyone had air-conditioning," recollects my friend Tony Shaieb, "you could walk down the street and listen to Ernie Harwell call the entire ball game through the open windows." Tony's memories are quite a bit more romantic than the eerie bluish-glow from my neighborhood's 60" plasmas tuned to Fox Sports Detroit. Ernie Harwell and Paul Carey broadcasting a Tigers game. A breeze blew to me the perfume of lawn-harvest and gasoline fumes. Despite my allergies I was in heaven -- I only needed a tall thick Pepsi bottle and my dad's transistor to take me back 40 years to Saturday afternoons in 1975 as the Tigers tried desperately to avoid breaking the most-consecutive-loss record. But it didn't matter because Ernie was with there. Thank you for letting me be part of your family. Thank you for taking me with you to that cottage up north, to the beach, the picnic, your workplace, your backyard. Thank you for sneaking your transistor under your pillow as you grew up loving the Tigers. Now I might have been a small part of your life, but you've been a very large part of mine. And it's my privilege and honor to share with you the greatest game of all. By all counts, Harwell was all about sharing. You could lean back and relax in the sunshine of his warm voice. He knew the incredible gift of simply chatting to a fan -- or even letting them join him in the booth for an inning or two. Harwell as a 1950s Baltimore broadcaster, with his collection growing too big already. In 1966, rather than hording his incredible collection of baseball memorabilia, he chose to share it with his fellow baseball fans through the Detroit Public Library. His first contribution of over 7,000 photographs began a 40 year process of not only donating but also a using the collection as a research-facility for the rich anecdotes that would make even an 8-run deficit in the third inning interesting to a Clawson fourth-grader -- priming the pump for the magical year of 1976, the year of the Bird, Mark Fidrych. Harwell's father was a baseball fan and like every tear-jerking scene from Field of Dreams, Harwell's "greatest game of all" suggests the importance of that game of catch in the yard -- often following a sweaty afternoon of yard work. It's the magical pause in life -- time to catch your breath, to have a conversation you might not have had were you not sitting in the shade listening to the game. On those Saturdays, my dad and I might have gone inside and stretched out on the shag-carpeting to catch George Kell and Al Kaline on Channel 4, but it wasn't the same as leaning back in a lawn chair and letting Harwell paint his pictures. Between games, he would visit his collection to work on his notes or just bring in a guest. 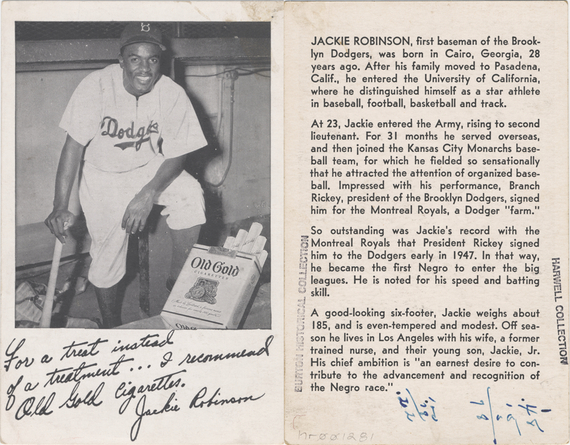 For collectors, the Ernie Harwell Sports Collection is a paradise -- and for baseball purists it's a shrine where you can hold an 1878 baseball card from a cigarette package or shake your head as Jackie Robinson praises Old Gold smokes. To visit the collection's fabulous exhibit room and then have Mark Bowden, its curator take me back into the endless stacks containing the treasures feels like I'm being welcomed back into Ernie's home -- a home that always felt like it was part mine anyway. I don't generally break into tears during editing (not joyful ones, anyway) but I did several times putting together our latest episode of the historical documentary series Digging Detroit (see below). But Ernie's beautiful, peaceful tones again was like a perfect breeze on a still summer night and I became a bit nostalgic remembering my father. Images courtesy of The Ernie Harwell Collection, Detroit Public Library.